It’s going to be a very merry Christmas with Smart Money Gift of Christmas Promo! Use your Smart Money account to remit money, reload your prepaid account, pay your bills, and many more! 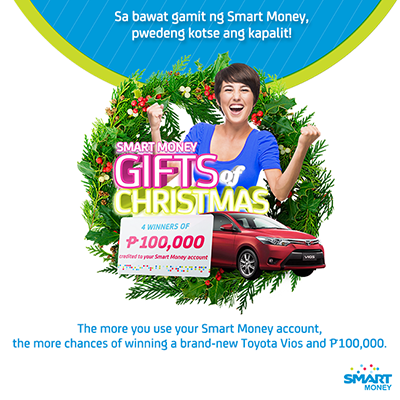 The more you use your Smart Money account, the more chances you get of winning a brand-new Toyota Vios or P100,000! Promo is open to new and existing SMART Money account holders. Promo runs from October 17, 2013 – January 15, 2014. Apply for a SMART Money Card and use it at least once within the promo period. Visit www1.smart.com.ph for full details of promo mechanics and check out the Smart Communications Facebook page for latest updates. HOW TO ENTER THE RAFFLE OF SMAETMONEY GIFT..